My daughter Natalie just had a birthday and we always go on some type of family adventure to celebrate our birthdays. This year, we planned a road trip to the gold country of Calaveras County for a caving, hiking, picnicing, and zip lining adventure. Our day started at the Moaning Cavern Adventure Park for a cavern tour that took us 165 feet below ground, rock climbing, gem panning, and a zip line race. After a picnic lunch, we drove down the road to the Natural Bridges Day Use Area to hike the two mile out and back trail to Natural Bridges Cave. Natural Bridges near Vallecito, California is a day-use area managed by the Bureau of Reclamation that provides year-round public access to an incredible natural cave. Duh. There is only a pit toilet (gross), parking isn’t great, and to reach Natural Bridges cave and swimming hole, you have to hike one mile downhill. No big deal, except you then have to hike one mile uphill back to your car — and you’re most likely going to be hiking back wet. Most people don’t want to work that hard to have fun, which is okay by me because it means less people! The Natural Bridges Trail is a beautiful two mile out and back trail that descends 300 feet to the canyon floor. To find the Natural Bridges Trail trailhead look for a round metal gate near the entrance on the east side of the road. The trail is rocky and uneven, so make sure you’re wearing sturdy shoes and watch out for poison oak. The trail starts out sort of paralleling Parrots Ferry Road, then drops down into a shady oak ravine before taking you across a small wooden footbridge to a wide dirt trail. You then turn right and follow the trail through spotted shade until you reach full sun and wind around the wall of the canyon formed by the rushing waters of Coyote Creek. The hike continues upstream as it descends to Coyote Creek. Just before the trail splits in two, there is a plaque commemorating the donation and public acquisition of the Natural Bridge. From here, turn left and take the stairs made from railroad ties past a picnic area down to the creek bed. Look to your right to see the Lower Natural Bridges cave entrance — this is the easiest way to reach the cave. If you continue straight on the trail instead, traveling over the top of the cave, you’ll reach the Upper Natural Bridges cave entrance and it’s a much steeper, rocky, awkward climb to the creek (not very family-friendly). 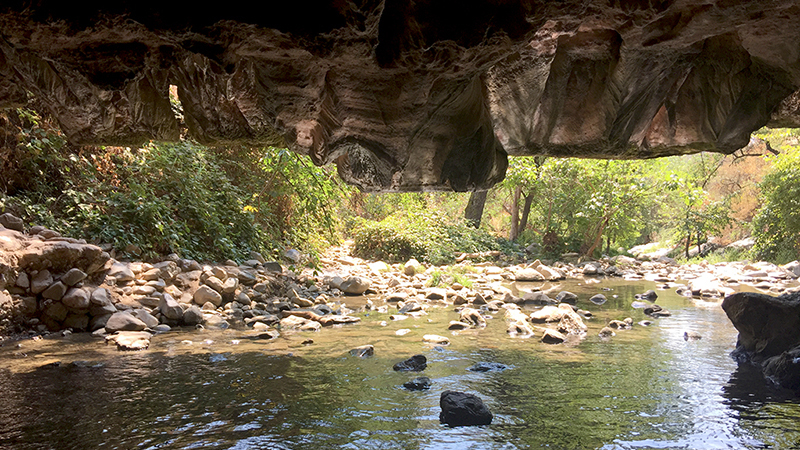 Upper Natural Bridges Cave Entrance: This is the north end where Coyote Creek enters the cave. It is a tall, round entrance with moss growing over the rocks and ferns spilling over to top of the arched limestone opening. This end of the cave also features “water tubs,” and views of the cave’s impressive vaulted ceiling. Lower Natural Bridges Cave Entrance: This is the south end where the Coyote Creek exits the cave. It is a wide, dark, low entrance dotted with moss. Just inside the cave entrance, under the rock ceiling, you’ll find small wall-caves for kids to climb in, a small waterfall dropping into the cave pool, and a large shallow but rocky play area protected from the sun. It is 250 feet from one end of Natural Bridges to the other and even in the summer the water is cold, really cold, ice chest cold. For this adventure, researched the hike so we were prepared. Brian hates cold water and I figured he wouldn’t get in. So we packed blow up tubes for the kids and I and a small air pump in our backpacks for this family adventure! That way, when we reached the cave, we could blow them up and float/paddle through to the other side. We also wore our bathing suits so it didn’t matter if we got wet, and we brought flip flops to change into later so we could wear out tennis shoes (sans socks) in the water to protect our feet. The kids and I got in the water and froze. OMG. The water is so cold. It took us a while to work up the nerve to get all in! 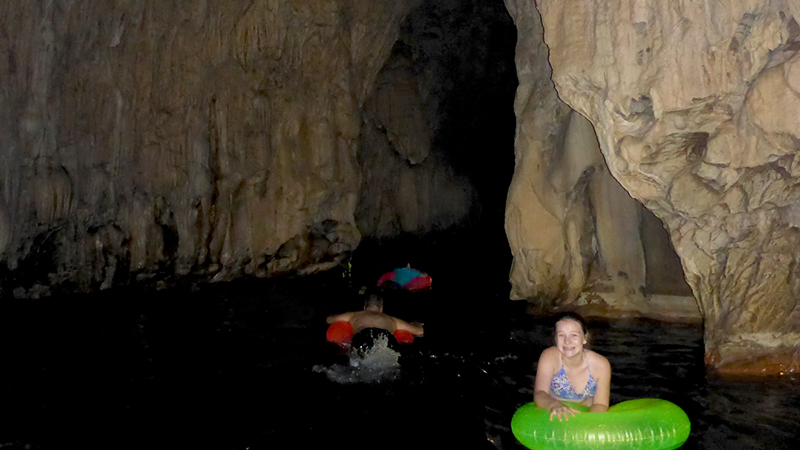 But then we hopped on our tubes and paddled through the cave. The experience was amazing! Everywhere we looked there was a cool rock formation and above us, the cave opened up into a huge vaulted ceiling. Once we got to the other side, the kids and agreed. Dad had to see this. So we sent Natalie back through the cave with two tubes to go get him so we could explore together. Carter, Brian, and Natalie hopped on the tubes to paddle from the north end of the cave 250 feet back the the south end, while I swam in the freezing cold water! Brian immediately grabbed Carter and got into the “hot tub” to enjoy the warmer water, while Natalie and I climbed up the creek a bit to get some better photos of the cave opening. Thank goodness I have a water camera! Several other hikers were asking about getting my camera wet — everyone wanted to take photos of the spectacular natural wonder! Eventually we were ready to swim back to the south end of the cave to play some more in the water and relax, and that’s when we realized there were four of us and three tubes. We could send a kid back and go in stages again, but I just decided to swim back and let Brian and the kids use the tubes. Whether it’s handing over my sweatshirt in the freezing cold or choosing to swim through freezing water, us moms are always the ones to sacrifice for the family. About half way through my 250 foot swim, my arms and legs were so cold that I noticed a distinct shift in how easy it was for me to swim. I felt numb and for a moment, I thought, “Am I going to make it?” Luckily the kids cheered me on and I made it no problem… but wow, it was so cold! After experiencing it myself, I’d never let a kid swim through the cave without a floatie! After our swim, we played and splashed in the water beneath the bridge, the kids climbed into the caves in the walls, and Natalie got under the freezing waterfall for a few photos. Then as it started to get more crowded, we packed up our backpacks and hiked the mile uphill back to the car, wet. In the parking lot, we did a quick “car change” back into dry clothes and flip flops for the ride home. Dry clothes and cold drinks from the ice chest were never more appreciated! The Natural Bridges Day Use Area Trailhead is located at 4988 Parrotts Ferry Road, Angels Camp, CA 95222. It is right next door to Moaning Cavern Adventure Park and you can do both in one day like we did! It’s free. While many of the caves and caverns in Calaveras County and Tuolumne County are privately managed and fee-based, visiting Natural Bridges is totally free. Don’t touch the walls of the cave. Explore the cave to your hearts content, but if you choose to swim through, don’t touch the walls for formations. The oils on your fingers and hands negatively affect the growth of the limestone deposits. You’re going to get wet. Water drips from the ceiling of the cave and to walk inside the Natural Bridges cave, you have to walk through water. At the very least, plan on your feet and legs getting wet. In warm weather, wear shorts or a bathing suit. In cold weather, wear knee-high rubber boots. Wear protective shoes. The floor of the cave is very rocky and it hurts to walk across it barefoot. Wear water shoes or tennis shoes and bring dry shoes for the ride home. We hiked to Natural Bridges cave in tennis shoes, took off our socks at the bottom, played in the cave in our tennis shoes, hiked back to the car in wet shoes, and changed into flip flops for the ride home. Wear a bathing suit. You can swim all the way through the cave and it’s an incredible experience. Everyone should wear a bathing suit — even if you’re just going to play in the water. Plus, there are natural warm water tubs at the upper cave entrance. Bring floaties. The water is freezing, dark, and deep in the middle of the cave, so bring floaties with you so you can float and paddle across the top of the water. We carried ours down in a backpack and blew them up in the shade of the cave. Some people brought down an inflatable boat. Pack a picnic. Enjoy lots of spotted shade and warm rocks to relax on and let the kids play. Stay for a while, have a picnic and make a day of it. There are no restrooms at the cave. The only restroom around is a pit toilet at the Natural Bridges Trailhead (in the parking area). Go before you hike down! Bring a waterproof camera. You’ll be hard-pressed to keep anything dry while swimming through the cave, and the water is dark, so if you drop a camera or phone, you’re not going to get it back. Bring a waterproof camera with a floating wrist strap so you can snap awesome photos of the cave and your family without stress. Visit early in the day. For fewer crowds, visit in the morning or during the week. The weekend afternoons get crowded and it’s much louder. No pets allowed. Signs posted at the trailhead clearly state that no pets are allowed on the trail or at the cave. The Natural Bridges Swimming Hole and Cave is an awesome geologic wonder and it is an incredible opportunity for families to have fun outside, enjoy nature, and see the unique rock formations and calcium deposits. It’s very popular and on weekends is very crowded. Please be courteous and don’t ruin the experience for many by being a jerk. Don’t hike down to the cave with your radio basting loud music or set your phone and bluetooth speaker on a rock and leave your music on the whole time you explore the cave. Everyone else didn’t come to the cave to to have a dance club experience. And please, let’s skip the profanity-laced rap music as there are lots of little kids playing here too. Don’t get drunk and obnoxious. First, it’s just not safe as the area is fairly treacherous if you’re not careful and someone can get seriously injured or drown — and you’re a one mile hike away from the road. Second, again, families are spending time here and it’s a lot of work to hike down with kids and gear and picnic food. Don’t bring giant floaties. Be aware that all of the people that hike down to the Natural Bridges swimming hole are doing to so enjoy the area and the cave’s natural beauty. Don’t bring a giant floatie that blocks the whole cave entrance and don’t leave your floatie in the water, in everyone else’s way when you’re not there. Don’t leave your trash. If you packed it in, pack it out — that includes all of your trash, empty soda cans and beer cans, and clothing. Help keep the area clean and beautiful for everyone to enjoy. I hope you check out the Natural Bridges cave — it is totally worth the hike!